Paddington is a 2014 live action film based on the much loved (especially in the UK) Paddington Bear books by Michael Bond. Passing through London Paddington Station, the Brown family encounter a young talking bear who has traveled from Darkest Peru in search of a home. They offer him a place to stay, though Mr. Brown firmly insists it's only temporary, and Hilarity Ensues. So does drama, after a taxidermist sees Paddington and plots to get her hands on him. A sequel called Paddington 2 was released in November, 2017. Paddington starts out as one of these, wearing a hat and nothing else. Later he works his way up a couple of rungs on the Appropriate Animal Attire ladder when Mrs. Bird gives him his trademark duffle coat. Aunt Lucy wears a necklace, a pair of glasses, and carries a cane. Accidental Hero: Paddington accidentally apprehends a pickpocket after mistakenly believing him to have dropped his wallet and trying to return it to him. We see a glimpse of Paddington's life in Darkest Peru, and why Aunt Lucy was no longer able to care for him. Mrs. Brown becomes a children books' illustrator and a Cloudcuckoolander. Mr. Brown becomes an Overprotective Dad (played for laughs) and risk analyst. Judy becomes your typical moody teenage daughter, with a knack in learning foreign languages. Jonathan becomes your typical rambunctious child who likes to make cool models and hopes to become an astronaut. Mrs. Bird becomes Scottish and really likes her whiskey. 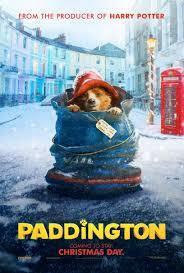 Adaptational Jerkass: Mr. Brown is less nice to Paddington in this version, but in time he warms up to him. Adaptational Nice Guy: Mr. Curry is less mean and just more grumpy in this adaptation. Adult Fear: Your home is destroyed in a natural disaster that also kills your husband. You can no longer care for your orphaned nephew so you have to send him away and hope for the best. Aerith and Bob: Played for Laughs. Montgomery Clyde names the two bears Lucy, after his wife, and Pastuzo - after a boxer. Alternative Foreign Theme Song: The theme song for the Japanese release is "Happiness " by AI. This is an odd case because AI uses a song that was already written before the film was even produced instead of writing a new one. Amazingly Embarrassing Parents: Mrs Brown towards Judy. For example, on learning that her daughter Judy has a crush on a boy called Tony, Mrs Browns first response is to happily squee about meeting him. Anachronism Stew: The film is mostly set in present day, but things like the old news reel and Geographer's Guild help to give the film a timeless feel. Arcadian Interlude: Paddington's old home in Peru. Artistic License  Geography: The taxi ride from Paddington Station to the Brown's home in Notting Hill (in reality not very far from one another) turns into a montage of EstablishingShots of famous landmarks from all over the city. Lampshaded immediately by Mr. Brown. Mr. Brown: What sort of route do you call that?! Cabbie: Well... young bear said it was his first time in London! Thought I'd show 'im the sights. Attractive Bent-Gender: The security guard thinks Mr. Brown is very attractive when disguised as a cleaner. Avoid the Dreaded G Rating: Averted the film was actually shooting for an U (Universal, or equivalent to a G rating) in the UK but got a PG instead for "dangerous behaviour, mild threat, innuendo, infrequent mild bad language." Considering Paddington Bears status as an icon for children of all ages in the UK, the PG rating was controversial and actually made news headlines criticizing the BBFC for giving the film a PG and comparing much more darker / violent material that had been given an U rating. The film also got a PG rating in the US, though not to as much attention as it did in the UK, however did get its desired G rating in Australia, Canada, Ireland, and New Zealand. Bag of Holding: During Paddington's boat trip to London, his only food is orange marmalade kept in his small suitcase. During an overhead shot, it appears that it only has room for 15 jars. However, by the end of the trip, there are several dozens of empty jars piled up in the lifeboat. Bamboo Technology: The bears' home in Peru is filled with it, including a stair lift for Aunt Lucy. Be Careful What You Wish For: Mr. Brown spends almost the entire movie trying to get rid of Paddington under the reasoning that he's a threat to the entire family. He gets his wish when Paddington eventually runs away... but has grown to like Paddington by this point so is clearly upset. And to make matters worse, it comes at the cost of him completely alienating his family when they view his response to this as being heartless and uncaring. Paddington's journey to London in hopes of finding the explorer but not knowing his name. After leaving the Browns he eventually locates the house. As it turns out, the explorer whose name is Montgomery Clyde, has since passed away. Finding Millicent, who now resides in the house alone, is his daughter who resents her father for turning over a new leaf and losing the Guild membership. She plans to do what her father didn't. Bears Are Bad News: As with the rest of the franchise, downplayed; Paddington does cause a fair bit of trouble and chaos to those around him, but it's trouble of the "well-meaning clumsiness inadvertently leading to mild catastrophes" variety. Implied when Mr. Brown tries to inform the insurance company he has a guest in the house that's a bear. Big Damn Heroes: The Browns and Mrs. Bird team up to rescue Paddington and foil Millicent's plans. The Big Damn Kiss: Mr. Brown gives one to Mrs. Brown when he is about to go out on the window ledge to rescue Paddington. Big Damn Movie: The Paddington Bear books are about Paddington comically misunderstanding everyday situations and muddling through regardless (although sometimes he has to give someone a Hard Stare). This movie is about him being pursued by a Cruella to Animals taxidermist. Bratty Teenage Daughter: Judy, but she gets less bratty as she warms up to Paddington. The Cameo: Matt Lucas as the London cabbie. Canon Foreigner: Millicent and her explorer father who never appeared in any of the books are brought in to make an action / thriller plot. Central Theme: A very topical one about welcoming immigrants. Cerebus Call Back: A comical scene has Paddington flying by Judy's school on an umbrella, which her class sees through the window, and it marks the start of Judy warming to him. After Paddington runs away, there's a shot of Judy in class and she looks sadly at the window - as if hoping to see him there. It even uses the same camera angle. The sandwich Paddington keeps under his hat for emergencies comes very handy when he needs to get out of a jam. The pigeons. They perform a Big Damn Heroes moment in the climax. The handheld vacuums and the sewers come in very handy during the climax. Chekhov's Skill: Early in the film, Judy is shown to be rather good at speaking Bear. This is useful when Paddington roars through a shaft to tell them he's going up to the roof. Cloudcuckoolander: Mrs. Brown. For starters tries to convince Judy to go exploring London's sewers with her. Cool and Unusual Punishment: Millicent is punished for her crimes by being given community service...at a petting zoo. Covered in Gunge: This ends up happening to Millicent, although it's not gunge so much as animal crap. Creator Cameo: Paddington Bear's author, Michael Bond is seen outside a cafe as they drive through London in a taxi. He smiles at Paddington and raises his glass of wine to him. In return, Paddington doffs his hat. Death by Adaptation: Uncle Pastuzo. In the books he's very much alive (and very rich) and traveling the world. Death Glare: Paddington's "hard stare." It has to be seen to be believed. Defrosting Ice Queen: A male version in Mr. Brown. It takes a while but he eventually warms up to Paddington. Disguised in Drag: Mr. Brown disguises himself as a female cleaner to infiltrate the Geographer's Guild. Disney Villain Death: Zigzagged. Paddington tries to distract Millicent by sending a flock of birds to swarm her, and she loses her balance but did not fall. As she tries to approach Paddington, she is knocked off the roof by a door but manages to catch a flagpole. Does This Remind You of Anything? : The conversation where Millicent stokes Mr. Curry's concerns about the newly arrived bear sounds rather like the xenophobic fears of a minority or immigrant moving into a suburban neighborhood, particularly how she says it "always starts with one", but that soon there will be lots of them "overrunning" the area. Dramatic Thunder: The scene where Millicent explains her plans for Paddington. Epic Fail: Paddington's trademark. No matter how simple and easy a task might be, trust Paddington to mess it up it in a spectacular fashion. Mr. Brown enthuses about their family outing to "the Victorian Wool Museum", scolds Jonathan with stats about childhood injuries when he leaps up onto a bench, shoots down Jonathan's desire to become an astronaut, and protectively shields his children and hurries them past Paddington while warning them not to make eye contact. We instantly learn that he's a bit boring, stuffy and over-protective, but does care about his children. His hidden heart of gold is also hinted at when, unlike everyone else in London so far, he politely acknowledges Paddington's existence, even if just to rebuff him. Mrs. Brown apparently jumped into a "Victorian bathing pond" (sans clothing) during the outing, embarrasses Judy by calling her an affectionate nickname, encourages Jonathan after Mr. Brown dismisses his wish to become an astronaut, and is the first person to actually approach Paddington and offer to help him. She's kind-hearted, eccentric and affectionate, albeit in an Amazingly Embarrassing Parents way. Jonathan leaps up onto a park bench, announces that he wants to be an astronaut, and is the second person after Mrs. Brown to approach Paddington. He's impulsive and excitement-seeking, but with a good heart. Judy reacts with sullen embarrassment to both her mother's actions on the outing and her mother's overtures, never takes her headphones off, and follows her father's instructions in keeping her eyes down when they pass Paddington. She's your typical moody, introverted teenager. Everyone Has Standards: Mr. Curry may not like Paddington but he won't see him taxidermied; he helped Millicent because he thought she was sending Paddington back to Peru. After realizing what he had done, Mr. Curry calls the Browns to tell them what happened so they can save Paddington. Family-Unfriendly Violence: Millicent's character has a few surprising moments of this for a family film, such as when she tortures the cab driver to figure out Paddington's location — even threatening to remove body parts and later on seems to have no problems with the idea of killing and stuffing the entire Brown family when they challenge her. Fantastic Racism: Paddington gets some of this for being a bear. Faux Affably Evil: Millicent maintains a soothing maternal tone, even when talking about how she is going to kill and stuff Paddington, who she is conversing with. Fish out of Water: Paddington doesn't quite get modern city life. For Inconvenience, Press "1": Mr. Brown is put on hold when calling his insurance company. "Get out of Jail Free" Card: Millicent spent half of the movie trying to add the obviously sentient Paddington to her stuffed animal collection. In-story it might be possible to mount a legal defence on the grounds that Paddington was not human, but she also was willing to kill and stuff the entire Brown family. Her punishment? Community service in a petting zoo. Getting Crap Past the Radar: The film manages to sneak in a few adult jokes. As Mr. Brown disguises himself as a cleaning lady to break into the Geographer's Guild's archive. Paddington: This is gonna work, Mr. Brown. You look very pretty. Mr. Brown: That's what they're gonna say to me in jail. When catching Millicent spying on Paddington, Mr. Curry initially accuses her of placing "unauthorised advertisements" in the phone booth she's hiding in. Among other things, this is quite frequently used as a method of advertising and soliciting prostitution. It's heavily implied that the flowers Mr. Curry later "found on a lamppost" and took to try and woo Millicent in fact came from a road accident memorial. G-Rated Drug: Peruvian bears really like marmalade. Lampshaded by Mr Brown describing it as "a worrying marmalade habit". Greek Chorus: The calypso band throughout the film. Great White Hunter: Subverted. The Explorer is about to shoot on the bears, but then one of them approaches him and knocks a scorpion of his jacket. He then sees they are intelligent enough to build bamboo technology and even learn English he befriends them and lets them live. Played straight however with the other members of the Geographer's Guild, however. HeelFace Turn: After seeing her true intentions and realizing he was nothing but Millicent's pawn, Mr Curry phones the Brown to tell them everything in an attempt to save Paddington. Hidden Depths: Mr Brown used to be as free-spirited as Mrs Brown. He changed after his first child was born. I'm Taking Her Home with Me! : Mrs. Brown's reaction to Paddington much to the (initial) chagrin of the other family members, except Jonathan. Improvised Weapon: Paddington is able to make clever use of his marmalade sandwich during the during the climax. Paddington: (with forced calm and a mouthful of cake) Mr Brown. That is extremely rude. Jerkass Has a Point: Mr. Brown isn't exactly wrong to be concerned about having a rather uncivilized and eccentric bear move into his house (or protective of his family in general); he just takes it a bit too far. Paddington himself admits that he probably didn't make the best first impression when he first arrived. Mr. Brown also points out that it's hard to find who the Explorer is if they don't know what his name in English is. Kindhearted Simpleton: Replace "Simpleton" with "Cloudcuckoolander" and you have Mrs. Brown; she's not unintelligent, but she does tend to live in the clouds a little bit, and judging from some rather pointed comments from Mr. Brown and Judy it is implied that she has allowed her kind heart to overrule her good judgement on more than one occasion. Mr. Brown: "Ketchup"? You want to call him "Ketchup"? "Ketchup the Bear"? Manic Pixie Dream Girl: Paddington seems to provide a non-romantic example for Mr Brown and Lucy. Played with regarding Mrs. Brown; she fits the general character type and has this kind of relationship with Mr. Brown in the present, but a flashback reveals that he was once just as adventurous, carefree and laidback as she is, only to become an uptight worry-wort the very second their first child was born. Magical Realism: The movie has this general vibe, what with the Wes Anderson-inspired "heightened reality" style, scenes such as viewing the goings-on in the Brown household through a dollhouse replica, and of course the talking clothed bear that no one seems to find unusual enough to comment on. Never Found the Body: The only thing that Paddington can find of Uncle Pastuzo is the hat. After the earthquake Paddington is desperately looking for his Uncle Pastuzo and all he can find is his hat. Cue bearhug between Paddington and Aunt Lucy. Averted with Paddington saying his parents died when he was very young, and Millicent saying her father is dead. The Nicknamer: Paddington at one point notes that Mrs. Brown has quite the talent for coming up with affectionate nicknames for her children that her daughter in particular finds excruciatingly embarrassing. No Animals Were Harmed: The credits assure us with tongue firmly in cheek that "No bears were harmed in the making of this film". Noodle Implements: When describing how the foibles of the Brown family are warming on him, Paddington brings up the numerous odd things that Mrs. Brown carries around in her purse for unknown reasons. This is accompanied by a shot of Mrs. Brown pulling out a mini-globe, a large lump of mineral, and a severed doll hand — the latter of which prompts an "Ah! There you are." Paddington when he realises that Millicent is planning to stuff him as an exhibit in the museum. Mr. Curry, when he learns that Millicent isn't interested in him and was just using him to get to Paddington, and also what her plans for Paddington are. Mr. Brown when he almost falls off the museum's facade and holds on to a gargoyle for dear life. Paddington again when he's about to fall into the museum's furnace. Millicent when the pigeons attack her. Opening The Floodgates: When Mr. Brown opens the door after Paddington floods the bathroom. Overprotective Dad: Mr. Brown is constantly fretting about the safety of his kids and family, which makes Paddington's clumsy presence less-than-thrilling for him. It's deconstructed, however, since he spends so much time worrying about their safety that it's heavily suggested that he's almost incapable of bonding with them any other way — he mistakes his children's happy laughter for screams, and completely alienates his family when his response to Paddington running away is to claim that it's better if they don't look for him since he didn't fit in, which just makes him look utterly heartless and uncaring to them. Paper-Thin Disguise: Mr. Brown's disguise as the cleaning lady. He even has his ID card examined by a rather dimwitted security guard and successfully explains away the changes in appearance - including a literal Spot Check and a missing arm. Parental Bonus: a few examples dotted throughout the film, the most darkly notable of which is the origin of the flowers Mr Curry presents to Millicent, which are heavily implied to have come from an accident memorial, given he found them tied to a lamppost. Parental Substitute: Aunt Lucy and Uncle Pastuzo are this to Paddington having raised him since his parents died, before the Browns take on the role. They use Mary's knowledge of the sewers to sneak in. Mrs Bird distracts the security guard with a drinking contest. Jonathan knows how to shut the power down. Judy hears Paddington growling and, understanding bear, is able to find out where he is. Henry climbs across the window ledge and later shields Paddington from Millicent. Pragmatic Adaptation: The filmmakers took the first few chapters of the first book A Bear Called Paddington and then crafted an original story, while staying true to the spirit of the books. Director Paul King said he was inspired by the line "Paddington soon settled down and became one of the family" and wanted to see how that would happen. Mrs. Bird: You just don't get it, do you? This family needs that wee bear every bit as much as he needs you. Related in the Adaptation: Mrs Bird was originally the Brown's housekeeper. It would be very unusual for a present day middle class English family to employ a live-in housekeeper so she is described as a relative, though what relationship she has to any of them is never stated. Running Gag: The flock of pigeons who pop up whenever Paddington tries to take a bite of his marmalade sandwich. Setting Update: The books were first written in the 1950s. The film is clearly set in modern times, but does have a timeless feel to it. The sequel dates it to the 2010s by showing The Spire in London. Shout-Out: The sequence in which Paddington climbs up the furnace chimney is a clear homage to the Burj Khalifa sequence in Mission: Impossible  Ghost Protocol, complete with one of the gloves failing at an inopportune time. For bonus points, the M:I theme briefly plays when Paddington begins to climb the chimney. Slapstick Knows No Gender: Millicent gets plenty of slapstick throughout the film; the oven exploding on her when she tries to catch Paddington the first time, a swarm of birds attack her and knock her off the museum roof and during the end sequence an avalanche of compost falls on her. Some Call Me "Tim": Paddington's original bear name is a deep, throaty growl that humans can't pronounce. When Mr. Brown tries, Paddington remarks that what he said was very rude. He gratefully accepts Mrs. Brown's suggestion of having a English name, "Paddington." Speaks Fluent Animal: Judy, who has a flair for languages, becomes fluent in Bear with Paddington's help. Later it becomes a Chekhov's Skill. Spiritual Successor: To Mary Poppins and Nanny McPhee. Instead of a magic nanny bringing harmony to a British family, it's a little bear from Peru looking for a new home, and he stays. Staircase Tumble: When Paddington gets tranquilised by Millicent, he ends up falling down the museum's staircase. Steam Punk: The Geographer's Guild with its pneumatic archive tube system. Television Geography: The five minute taxi ride from Paddington Station to the Browns' house would pass precisely none of the mandatory London landmarks shown en route. Lampshaded by Mr Brown and by the cabby's reply: "The bear said it was his first time in London." Paddington: I'm a bear. A bear called Paddington. Trademark Favorite Food: Marmalade for Paddington. Pastuzo and Lucy are also obsessed with marmalade. Tragic Keepsake: Paddington's hat. It used to belong his Uncle Pastuzo. The Unpronounceable: Paddington's real name is a sort of roaring noise that humans can't manage. Mr Brown's attempt gets an Informed Obscenity reaction from Paddington. Hilariously Paddington is seen giving Judy lessons in bear language and she's rather adept at it. Unusually Uninteresting Sight: Everyone in London seems very uninterested that there's a talking bear wandering about. It's even lampshaded when Johnathan says he didn't know bears could talk, Paddington remarks that he's a very rare kind of bear. In Peru, there's a real retirement home for them. Unwitting Pawn: Mr. Curry never realizes that Millicent is using him to get to Paddington, until it's too late. Vile Villain, Saccharine Show: A nice kiddie film about a bear from Peru trying to be accepted by his adoptive family in Britain... with a villainous taxidermist that wants to turn him into a stuffed animal for her collection and will not let anything stop her, which includes attacking security guards, torturing people and trying to kill several humans (including said adoptive family) that get in her way. Villainous Breakdown: Millicent loses it when her plans are foiled. Wig, Dress, Accent: When Mr. Brown poses as a cleaning lady in order to sneak into the post office. Wrench Wench: Mrs Bird is seen welding the bathtub after Paddington's accident.